Strolling around Patmos while soaking up the various amazing vibes will be enough spiritual and cultural stimulation for most visitors. On such a unmolested, natural haven, you couldn’t (and shouldn’t) find many crowded touristy “sights” or elaborate museums – apart from Chora’s great monastery castle perhaps – but the whole place is a site and an outdoors museum in itself. 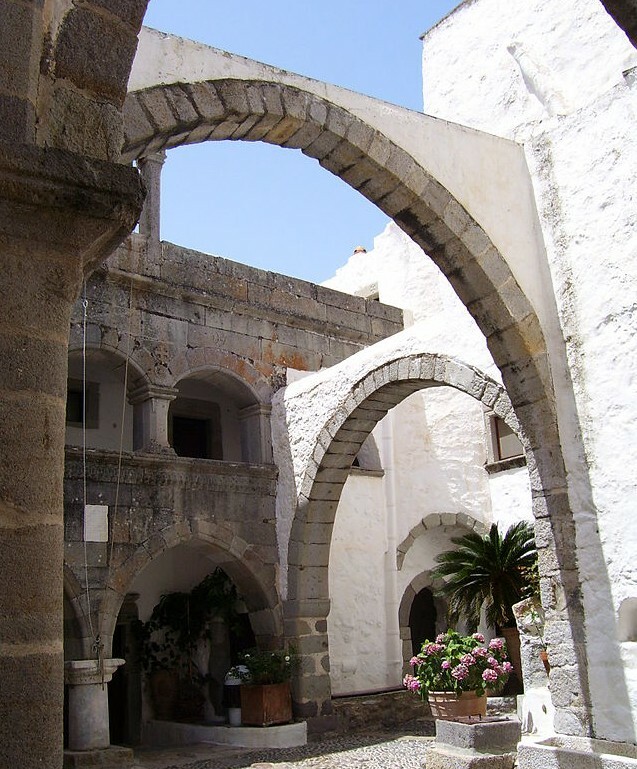 The first thing you notice on Patmos is the monastery of St John the Divine or the Evangelist since it crowns the largest central hill of Hora. It looks like a Byzantine castle, it was built like a fortress and its presence is still overwhelming. 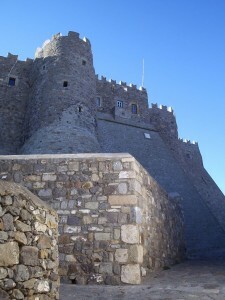 During the reign of Arabic influence from the 7th to the 9th century A.D., Patmos Island was almost left a deserted island but, in 1088 a gifted and educated monk called Christodoulos otherwise known as ‘Latrinos’ requested and was granted possession of all the island by the Byzantine Emperor Alexius I Comninos to establish a Monastery in honor of Saint John the Evangelist and to transform the Cave of the Apocalypse into a sacred place. 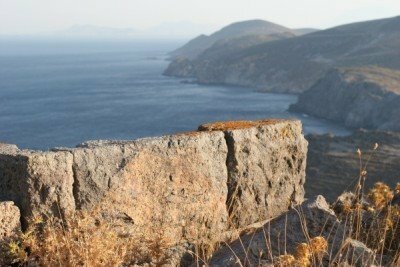 Christodoulos stayed on Patmos Island until Arab pirate raids forced him to leave the island in 1118 but his vision continued to inspire enlightened monks who continued his work in the next centuries. 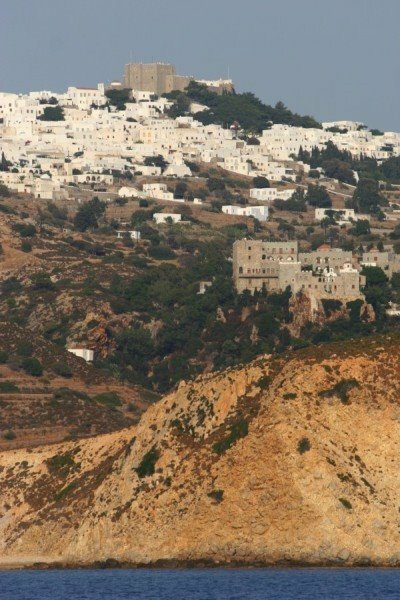 The construction of the Monastery of Saint John the Theologian and the Monastery of the Apocalypse Cave marked the genesis of a cultural, spiritual and religious center which is a reference point for the whole Christian world and ensured the parallel, remarkable development of Patmos. Ever since, the Monastery dominates not only the Chora of Patmos Island which is built around it today but the entire island. It is surrounded by an irregular, rectangular defensive arcade which dates from the end of the 11th up till the 17th century. The monastery’s walls are over 15 meters high, its length from north to south is 53 meters and from east to west 70 meters and it seems even larger when you stand at the entrance, noticing its thick walls and heavily reinforced door. Above the entrance several meters high there is a small opening from which burning hot oil, water, even lead was poured over to attacking pirates and other invaders trying to break the gate. This opening was called “the killer”, and was considered the last resort for keeping the Monastery safe from dangerous vandals and tresspassers. The monks used to sound the bells to warn the people of Patmos to take refuge behind the fortified walls of the monastery, keeping the Christian Church safe as was intended by the Monastery’s founder, Hosios (Blessed) Christodoulos. The main entrance is on the north side but there is also a smaller entrance on the south side that is now closed off. The monastery was not fully complete in 1088 and evolved along with the wants and needs of the monks and the church. The oldest parts are the eastern and northern sides, they can be distinguished by their irregular shaped walls that were constructed in haste during the first years in order to complete the protection of the area. As you enter its gate, you come to the main courtyard laid in by local pebbles and stones. Looking around you notice many different levels as a result of rearrangements and additions that have taken place through the centuries . In the center of the courtyard lies a round covered structure that looks like a well and it is in fact a very large jar that was once used to store wine and now contains holy water. To the left is the main chapel, one of the first buildings to be erected as early as 1090. As you face the main chapel (catholicon), there are four arched colonnades and behind them you can discern the outer narthex with its wall paintings. The upper paintings are from the 17th century and represent different miracles performed by Saint John the Divine and the lower date from the 19th century. 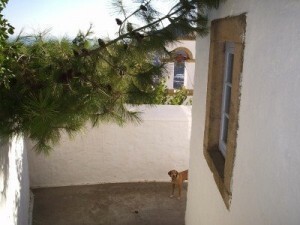 To the right of the main chapel, lies the chapel of the Holy Christodoulos. Inside it are the skull of St Thomas, pieces of the Holy Cross and other religious relics. Inside the main chapel you will notice the overwhelming and three dimensional carved wooden “iconostasi”, dating from 1820. This iconostasi replaced an older one from the 15th century, which in its turn had replaced the original marble one that Hosios Christodoulos had installed. The current iconostasi is a gift from Nektarios, the Patmian metropolitan of Sardis, it was made by 12 wood carvers from the island of Hios, its detail is astonishing and it still leaves gazing visitors speechless. The acoustics of the room are incredible and listening to Byzantine hymns during mass can be an unforgettable experience. The Orthodox Church does not allow more than one ceremony per altar per day so the monastery has 10 chapels, and three of them are outside the boundaries of the monastery. At the entrance in the north is Saint Apostles, Saint George is to the east and Saint Fanourios on the west of the monastery. Inside the monastery are the chapels of Holy Christodoulos, St Nicholas, St John the Baptist, St Basil, The Holy Cross, All Saints and the chapel of the Virgin Mary. To the right of the main church is the chapel of the Holy Christodoulos and inside are his remains as he requested after his death in 1093. Next to the main church, is the chapel of The Virgin Mary, with wall paintings dating back from the 12th century and onwards and there are no words that could sufficiently describe their beauty. Behind the chapel of The Virgin Mary and extending to the south is the refectory where the monks ate their meals in unison. 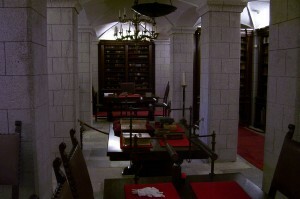 It is a rectangular room about 50 square meters and 8 meters high and there are two long tables covered with marble, still preserved intact. There are niches in them where monks placed their personal items as well as beautiful frescos and wall paintings dating back to 1180. Across the main courtyard on the first floor, lies the old bakery, where the remains of a huge stone oven and a long wooden trough where the monks used to knead their bread, can be seen. These were built in 1088 and are mentioned in the writings of Hosios Christodoulos when he elected a man from the brotherhood, to become responsible for the running and maintenance of the room, a man he referred to as “the cellar man”. The museum is located next to the bakery and has an entrance fee of around 6 euros. It was also erected by the Blessed Christodoulos who bequeathed to it his most precious icons listed in his will. As a result, it has an amazing collection of icons, original manuscripts from the Bible, objects of silver and gold, sacred relics, vestments embroiled with silver or gold threads, colored silk threads and bejeweled with precious stones to list a few. Most of the items within the museum, have to be seen up close to be properly appreciated. Holy Christodoulos also founded the monastery library since when he arrived on the island, he brought with him his personal collection of books including manuscripts from the monastic area of Mt. Latmos. The Monastery’s library is now home now to more than 3000 printed books, 900 manuscripts and 13000 documents dating back to 1073.This room is not open to the public except by special permission, obtained usually by Byzantine and biblical scholars. The rest of the monastery consists of two treasuries preserving invaluable treasures, the monk’s cells, the flourmill, store rooms, a conference room and a research room with new books and magazines but all these areas are not open to the general public. The entire complex of the Monastery constitutes an excellent example of monastic, fortified architecture which is very rare in the world and remains almost intact from the Middle Ages up till today. To get to the monastery, you have to follow the steep uphill paved road to the left after the kiosk that is near the bus station. You will pass a couple of restaurants and gift shops and at the end of the uphill, at your left there are stairs that lead you to the Monastery. The bus service runs regularly from Skala, Hora, Grikos and Kambos and you can check the timetables for details. If you choose to drive, parking will not be a problem, even though during high season you might only be able to park a few hundred meters away. Generally, please keep in mind that no driving or riding is allowed inside Chora itself so in the afternoon, taking a bus up to Hora and walking down the Old Path to the Cave of the Revelation and to Skala might be an interesting journey and experience. What to Wear: Knees and shoulders should be covered while visiting all monasteries by both male and females. DAILY FROM 08:00-13:00 AND 14:00-16:00 ON SUNDAYS, TUESDAYS AND THURSDAYS. Almost two thousand years ago, in 95AD, in a grotto on Patmos, the beloved disciple of Jesus, St. John the Apostle had a tremendous vision of the world to come, until the end of time. His student, Prohoros, wrote down this vision by order of the Lord, and ever since, it is known as the 27th and final chapter of the Holy Bible. The Cave of the Revelation lies between Chora and Skala and is the place where St. John had his tremendous vision of Apocalypse, which constitutes the only prophetic book of the New Testament. The spot around the cavern was the one initially chosen for the Monastery of St John. Upon his arrival though, Christodoulos decided to build it instead on a higher point, on its current position, making it less vulnerable to raids. 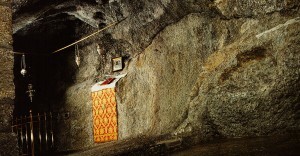 On the sacred ground of the Revelation, he decided to build a hermitage, covering the cave at its core. He started off by closing off the cave with the building of a chapel, that he named as St Anne’s after his mother, the Virgin Mary’s mother and the mother of emperor Alexios I. Komninos, who was called Anna Dalassini and was the one who advised her son to cede the island of Patmos to St. John’s Monastery. Today, more than two thousand years later, the Cave remains surrounded by the whole monastery, which stands out with its white color and a few steps carved on the stone lead to the lowest level, while passing through the chapels of St. Nicholas, St. Artemios and St. Anna. Upon entering the cavern, you are impressed by its natural positioning and instinctively tend to ponder why the Lord picked this particular place in the world to reveal His Apocalypse. The rock formation is volcanic and rare, taking hundreds of years to cool off and it still shines at some points from the water that was trapped in it without vaporizing. To the right, there is the sacred cave and church of Saint John the Divine. In the center, between the cave and the chapel, the low rock ceiling reaches out in a clear threefold split, the sign of the Holy Trinity and also the shape that the orthodox pilgrims form with their three fingers, when making the sign of the cross, starting from their foreheads. Looking closely at the three – part rock you will notice that it is very odd that a rock should split in three like that. There seems to be no easy explanation of the shape of the rock, reinforcing the faith that this place is special and it was indeed here that God communicated with Saint John giving him the vision of the Apocalypse. In the back of the cave, there is a fenced off section were a niche in the rock shows were the saint laid his head to rest. To the left, if you look closely you will see a relief of a Greek cross which, according to tradition, was engraved supernaturally or by Saint John himself. A little higher to the right there is another niche, where the Apostle held on to the rock to raise himself up from his resting place and to lean against while dictating the words of God to his pupil Prohoros who stood next to him, on a natural rock desk that can still be seen. Continuing right and close to the entrance, a narrow channel in the rock that is believed to have provided water to the both of them, from a spring that cannot be found to date. There is usually a monk or some spiritual leader who will guide you through the cave awaiting you at the entrance, although it is recommended to sit on one of the stools and sink in the energy of this miraculous cave that some believe is one of the great mysteries of the world. In the monastery complex there are also two more churches, one of St. Artemios (18th century) and St. Nicolaos, monk cells, and other facilities as would be expected in a monastery, most of which were built by Osios Christodoulos and his men in 1088. According to historians St. John and Prohoros stayed 18 months on Patmos, and then returned to Ephesus, the place they were exiled from for preaching in the Lord’s name. There, they wrote the 4th book of the New Testament. 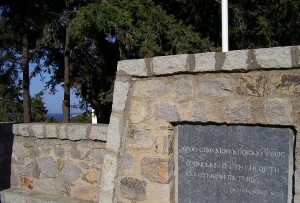 The Cave of the Revelation is within walking distance of Skala (1.5km) and Chora (1.6km). There is a regular bus service that leaves you close to the entrance in the middle of the main route that connects Skala and Hora . You can ask the driver to tell you when to get off, if you are not sure yourself. From Skala you can also walk up to the Cave by either taking the main road or the shorter and more picturesque approach “the Old Path”. The same applies for walking down from Chora but in both cases be prepared for a long hike under the blazing sun. When visiting the Monastery and all the other religious sites on the Island please try to be dressed properly: women must wear long skirts and have covered shoulders, men must wear long trousers. The convent of the Annunciation or Evangelismos is located on the southwest side of Hora overlooking the Bay of Kipos (gardens) and is about a 15 minute walk from the bus station. The convent initiated as a small chapel with a hermitage until 1613 when Nikiphoros, an abbot from the monastery of St. John the Divine, renovated the building and dedicated it to Luke the Evangelist. The hermitage was later supplemented with new buildings in 1937 by the monk Amphilohios Makris thus founding the Convent of the Annunciation. The sisterhood is home to over 40 nuns who apart from praying, occupy themselves with social welfare, gardening, beekeeping and Byzantine embroidery called “spitha” (spark), which was used to make embroidery for aristocratic Byzantine families from the time of Hosios Cristodoulos. 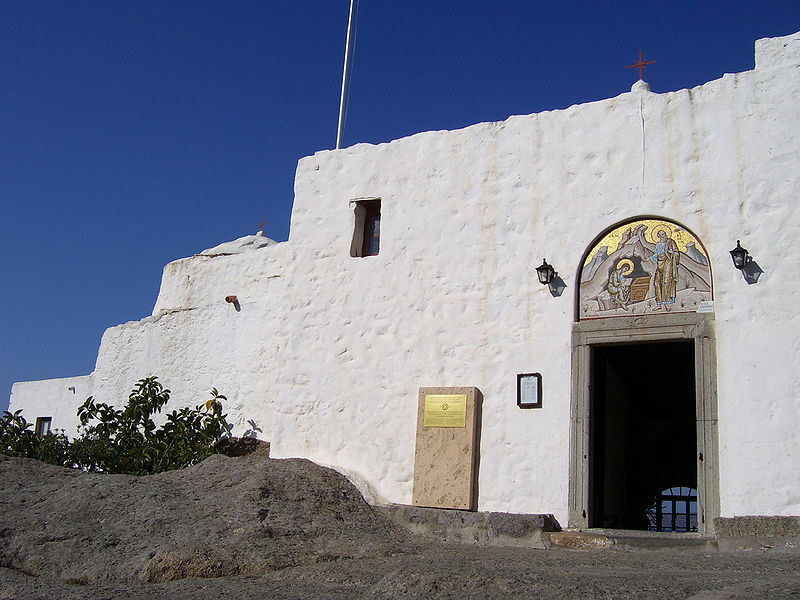 The convent consists of the church Evangelistria (our lady of the Annunciation) connecting with the side chapel of Agios Loukas (St. Luke) and the chapel of Agios Antonios (St. Anthony) stationed in the tower of the convent. The icons in the church date back to the 15th, 16th and 17th century. The nunnery lies to the southwest below Hora. It will take 20 minutes on foot from the bus station in Hora. There is a road that takes you to the entrance, to get there turn right at the first large crossroad as you leave Hora for Grikos, turn right again at the first street, over the hill and follow the turning road to the nunnery. At one point on this road you can turn off and it may seem that you are continuing your way up to Hora this is the wrong way. Without private transport you can catch a bus to Hora. Walk up to the old market place “Platia Losa” that is easily distinguished from the statue of Emmanuel Xanthos and the town hall. Walk past the town hall down a narrow street, you will pass a small mini-market on the left and soon come to a crossroad. Keep to the right until the next junction, where there are three wooden arrows, one will lead you down a flight of stairs. There, after two side streets you turn right, and right again when the street forks. Continue until you reach a small square. Here you choose the path on the right until you come to three whitewashed chapels. The biggest of them (on the right) is a tiny nunnery with one nun and for a small contribution may be visited. On the right behind this chapel-nunnery is a footpath through untouched landscape. After about 400 meters the footpath divides, the left turn takes you to an asphalt road that leads you to the gate of the nunnery. The nunnery of Zoodochou Pigis (“Life-giving Source”) is a womens’ convent in Chora which was founded by the Abbot of the monastery of St. John, Parthenios Pangostas in 1607. It’s only a 5-minute walk from the monastery but not touristy, making it peaceful and fulfilling. Even though it’s under renovation, the little you see of the convent is enough to make it worth the effort since the courtyards are filled with bougainvilleas and other flourishing flowers well taken care of by the nuns. There are two churches inside, named Zoodohou Pigis’ and St. John the Theologian’s, that both have icons of the 16th to the 18th century and apart from philanthropic work, the nuns also make incense and sow or embroider religious garments. The nunnery lies in the south-western part of Hora and to get there, you must find your way to Hora and start at the square “Platia Lotza”, where the Town Hall and the statue of Emmanuel Xanthos stand, once the location of the old market place. Walking past the town hall and down a narrow street, you will pass a mini-market on the left and soon come to a crossroad. Keep to the right until the next junction, where there are three wooden signs on the walls. One shows the way to the Nunnery of the Annunciation and two on the right refer to Zoodohou Pigis. Here you take the small street indicated until a small alleyway opens on your left, and 5 meters farther down lies the entrance to the nunnery. A narrow passage takes you between high white walls past a main entrance and a big wooden gate reinforced with iron, which stands half open, invitingly, during visiting hours. If you are not deterred by climbing and heights, visit the monastery of Profitis Elias (“Prophet Elijah “) where you’ll get a fantastic view since it is the highest point of the island (269m). On a clear day, you’ll see as far as the islands of Lipsi, Leros, Kalymnos and even Kos. 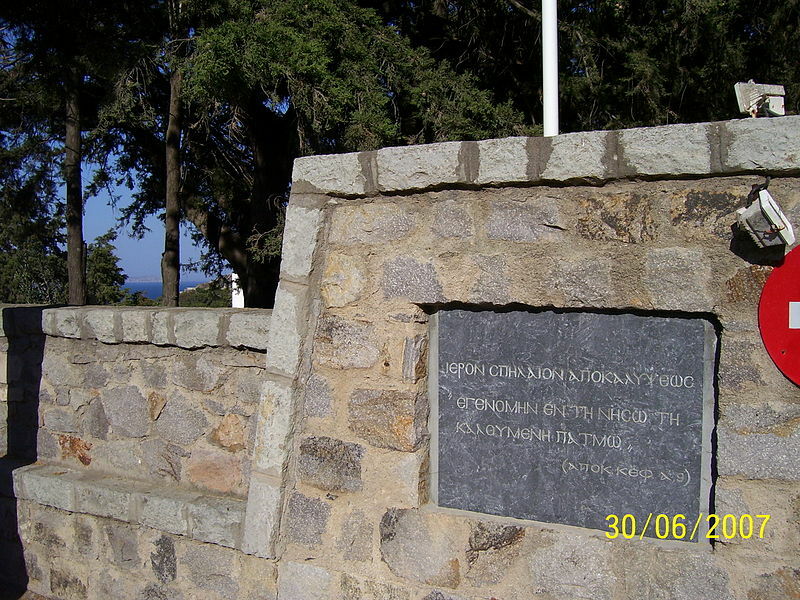 In Chora you can also see the home of Emmanuel Xanthos, one of the founding members of the Society of Friends that was the first revolutionary organization that led to the successful War of Independence of Greece against the Ottoman Empire. To one side of the monastery in Chora on a hill lie three old windmills and there are fine views over Patmos from this point.